Over the last several centuries Matora has risen from a port city of the Savon Empire to one of the premier Maritime Republics in the region of the Bergatino City States. It's navy serves as the dominant force in the western Catellus Sea. Its location has made it the primary point between East and West, and it is one of the few centers of wealth in the world. The city and republic is organized under the rule of a Duca/Duchessa. This is not hereditary but an elected official. Chosen from the Contes/Contessas of the Major Council, organized in a body of 30 individuals, each representing a great house with responsibility for one of the 30 districts of the city state as a whole. Two other councils serve for the operation of the city. These are the Council Minor and the Ventura Council. The Council Minor is a body of leading Patrizio; aristocratic non-nobles that have gained wealth and influence in the city. The Ventura Council serves as an organization to appoint contracts of venture on behalf of Matora, both to the Ventura as well as other enterprises. The Ventura serves as a primary judiciary body for Matora as well. Within the councils and politics of Matora, and the city-states at large, there is a political division. There is a divide between those loyal to the Paragons of the Three Divinities and the Paragon State while some families have retained a loyalty to the roots set by the earlier conquest of the Divine Empire that saw the area known as the Kingdom of Saule. While it is all but the same religion, there is a divide. The former supporters of the Paragon State are known as the Sacario while those in favor of the Divine Empire and in support of the lineage and birthright of the Emperor are known as the Caroligio. The current duke of Matora is Piero of the Zianii family. The Ziannii are staunch Caroligio and long standing members on the Major Council. Ziannii is an age old family in the city with ties back to the Eastern Empire. It is believed they hold ties with the Windischmann family (Lukas Windischmann is the King of Bohr), there is a marriage/relation to a Count of Bohr (Count Dietger of Wolkerk). Some still accuse the Ziannii of being an instrument to the Bohr invasion of Breganze in 1330. Currently the Ventura Council has awarded the contract of City Guard to the Wyvern Company. With a two year contract with Matora, the Wyvern Company has 500 individuals on consistent duty in the city itself, including no less than 200 assigned to the city wall; this includes dock operations. The city guard is known for their maroon colored cloaks with the emblem of a Wyvern embroidered over their breast. Technically there is no standing army of Matora. Like many of the city-states, Matora contracts with the Ventura as needed. For Matora any potential Ventura company must be vetted by the Ventura Council first. There are two primary companies which Matora regularly contracts. These are The Ventura di Gaddiel the Devout (The company of Gaddiel the Adherent) and the Omega Company. In the later part of the Fifth Century, Savo was sacked and the Savon Empire collapsed. The Reverends of the Paragons of the Three Divinities began to wander at this time, staying shortly in Landro a larger city at the time. Matora had built walls to protect from invading barbarians from the north and east and after Landro was sacked, the Reverends stayed in the city for a few decades. They were pushed out by the Eastern Empire and Matora became a province under the Emperor of the East. In the 8th century, the city elected its first Duca. Several decades later, this position was recognized by the Eastern Empire. The city shared its early foundation with the Empire. In the 9th Century, merchants of Matora acquired the relics of Marcus the Devout from the Temple of Marcus in Nirenae. The city proclaimed Marcus the Patron Devout of Matora and the Devout remains so to this day. 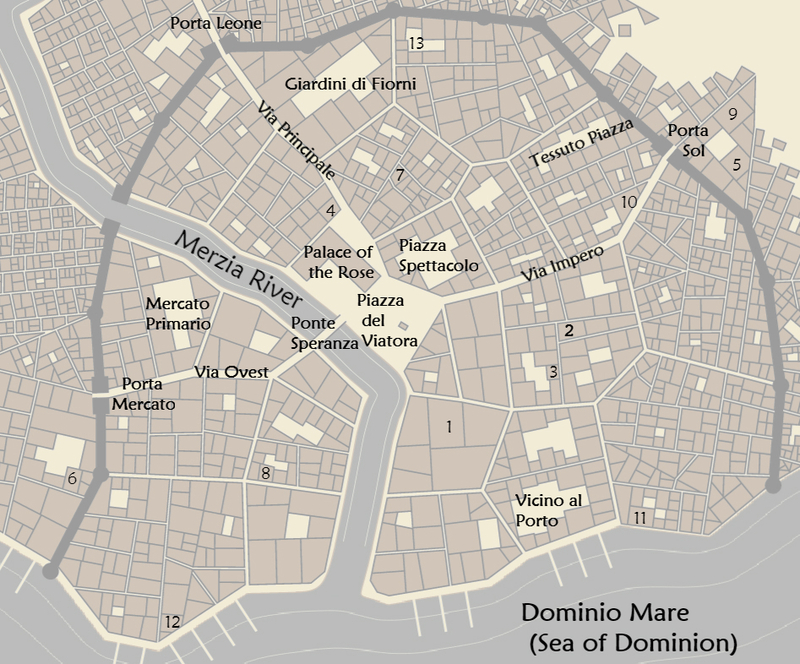 In the 11th Century, the Empire granted tax free trade rites to Matora in the Dominio Mare, in part to allow the growing naval superiority of Matora to deal with the growing influence of the Navagerse in the region. The city pushed out pirates along the eastern shores of Dominio Mare, acquiring the kingdoms of Salzia and Pelcortia at this time. After the 12th Century, the ties to the Eastern Empire are severed as the influence of the Empire begins to dwindle in the west. On the heels of this, invaders from the north make conquest of the cities of Bergatino, forming the Kingdom of Saule under the governance of the Divine Empire. With nearly a hundred years of Imperial Decree, the cities unite long enough to form the Saule Pact and force the Empire to withdraw from the region. Following the collapse of the Kingdom of Saule about a century ago, Matora has solidified its liberty through the enactment of a council of governance from its great families. This is the Major Council, which includes thirty seats to hold a representative of each of the thirty houses. Each house is relative to a District of Matora, each family under a Conte or Contessa. These individuals are responsible for the semi-annual election of the Duca/Duchessa of Matora. The Centum of Marcus the Devout, a Devout of the Sect of Devotion, Marcus is known as the Rose of Matora. Centuries ago in the city of Nirenae as the Faith of the First Dawn Spread among the Kataro Kingdoms, the Ascendant of the Temple of Nirenae entrusted merchants with the relics of Marcus the Devout for safety in fear the Faithful would destroy the temple. These were brought to Matora and Marcus the Devout was proclaimed Patron Devout of Matora. The plaza of travelers is the central piazza of Matora. The Pagent Plaza is just off the Piazza del Viatora and is set aside from the sport of jousting. Tournaments are held here in the city and when not used for pagent or spectacle, it can be used for training of the martial minded sons and daughters of the great houses for practice. This is held and reserved for the Duca/Duchessa as elected by the Major Council. It includes chambers to meet with the various councils as needed by the Duca of Matora. The Bridge of Hope. This was erected in the year 1254. It is a covered bridge with several small buildings on either side and over the bridge itself. Main thoroughfare out into and out of Matora, connects to roads that lead to the major cities of the Peninsula and beyond. An old road that used to head east in the days Matora served as a provincial district of the Eastern Empire. The West Road, connects to primary markets within the city walls and outside. Where the River meets Dominio Mare is a tame stretch of river, brought under control as the city arose here. Initially something of a delta/swamp like region, the river was calmed here. Before the rise of bridges, locals favored a very flat skiff and pole to make way back and forth across the river, many still do despite the two bridges in the city itself. The Market Gate. Large markets exist inside and outside near this gate, it has taken its name from such. The Sun Gate. In commemoration, or perhaps defiance to some level, it is adorned with large golden lions acquired in 1204 during the sack of Thassaldromo, the capital of the Eastern Empire. The lions serve as indication of the period when Matora severed its service as a district of the Eastern Empire. This gate is adorned with the statues of Lions, with garlands of roses, acquired from the ancient city of Nirenae, southwest over the Catellus Sea. Named for the Lions, that serve as symbolic to the relation between the city and its Patron Devout, Marcus of the Rose. Garden of the Blossoms. Initially markets that have fallen out of service in this noble district of the city, several families have contributed to the creation of a botanical garden in the city. Erected in the year 1333, this garden now has several years of growth to its local and exotic flowers, beginning to show the marvel of the architecture and design of these gardens. The Plaza of Fabrics. Wool is a primary export of the region, and Matora serves as a primary distribution center of fabric and dyes. This plaza is a mix of fabrics and fashion, along with vats for dying, making it a colorful location. Many of the best tailors of Matora have shops in or close to this plaza. 12 - Siren's Song - a house of ill repute? 13 - Piazza del Campo da Gioco - Game Court Plaza, established as a shared court, initially for the training within the city for archery, but doubles for squash/tennis like games and sports of leisure as well. Generally only the nobility are allowed in this court.